White paper on crime 2001 Part3/Chap.1/Sec.4/1. A typical juvenile delinquent group is that of motorcycle gangs, known as bosozoku, that cause disturbances and acts of violence, etc. Fig. III-11 shows the trends in the membership and number of bosozoku in the last ten years. 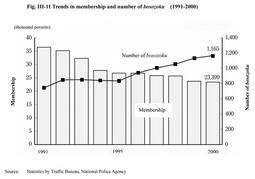 Membership has decreased consistently, numbering 23,399 persons (a drop of 1.3% from the previous year) in 2000. Meanwhile, the number of bosozoku has been on an upward trend, rising to 1,165 (an increase of 2.9% from the previous year) in 2000. With respect to the size of bosozoku, the percentage of such gangs with30or more members fell from 17.1% in 1991 to 6.5% in 2000, indicating that these gangs are becoming smaller in scale (source:Traffic Bureau, National Police Agency). Fig. III-12 shows the trends in the number of juveniles cleared for penal code offenses of bosozoku and the percentage of the membership of such gangs in the number of juveniles cleared for penal code offenses by type of offense for the past 10 years. The number of juveniles in bosozoku cleared for penal code offenses has been increasing since 1996, and came to 3,623 (an increase of 12.4% from the previous year)in 2000. 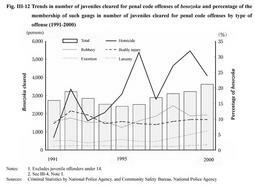 In view of the trends in the percentage of the membership of bosozoku among the number of juveniles cleared for penal code offenses by type of offense, homicide is the highest, except for those in 1991 and in 1993. Likewise, the percentage of robbery has exceeded 10% since 1997. In contrast, larceny has remained at around1%each year.